Excess weight has become a rather widespread problem. There are thousands of people all around the world who suffer from it and want to change their lives. Luckily, there are methods that can help in this situation. As a rule, people also want to get rid of certain problem areas. Someone wants to reduce belly fat, others what to get rid of inner thigh fat. Today, we are going to tell you about side and back fat and how to get rid of it. Side and back fat are a rather widespread problem which lowers our self-esteem and makes us feel unconfident. We can’t even wear tight clothes that will emphasize this area. That’s why it is important to get rid of the problem. The best thing will be to combine healthy eating and regular physical activity. In this way your excess weight will go away gradually, and you won’t harm your health. However, you should do your best to choose the most effective methods. As for the dieting, it’s important to quit junk, fatty, and sugary foods. You should add fiber, protein, healthy fats, carbs and various vitamins. To get the most suitable meal plan you can consult your doctor. Diet will help you to lose excess body fat and flush the toxins out of your body. However, there will be no such a great effect without physical exercises. They will help to burn calories and tone your muscles. That’s why today we have prepared something especially for this case. 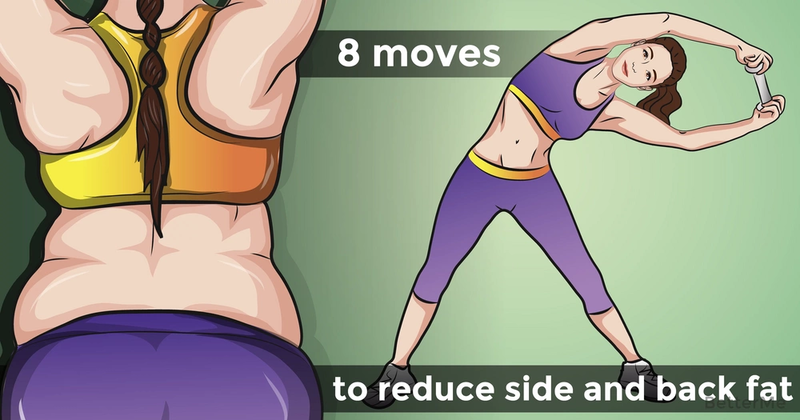 Here are the most effective exercises that will help you to get rid of side and back fat. By performing them regularly you’ll solve your problem in a short period of time. So try our workout and you won’t regret it!